Your Cat’s Inappropriate Elimination and What You can Do About It. A cat that stops using the litter box creates all sorts of problems. Did you know that it’s the most common reason for pet owners to relinquish their pet cat? UTI. Your cat may have a physical problem like a urinary tract infection, feline lower urinary tract disease, kidney or liver diseases, or struvite crystals. The best way to rule these out or to pinpoint a physical problem is to bring your cat into Town N Country for a check-up. P. U. If you’re a cat lover, you already know that cats are fastidious and need a clean box. 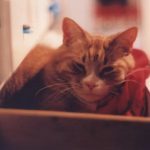 Scooping out your cat’s box is a daily task, and dumping the litter, cleaning the box and starting with fresh litter should happen once a week. If you don’t…your Persian carpet may be at risk! Stresssss. Another reason for inappropriate elimination could be stress-related. With multiple cats, one cat might be bullying another. It’s recommended that cat owners have at least one litter box per cat. Or the placement of the box might not suit your cat. For instance, your cat might not prefer the box near a vent where the air movement and noise could startle. Is your litter box near a high traffic area in your house? Or is it placed near a noisy appliance? Some rearranging could solve your problem. X Marks the Spot. Inappropriate urination could indicate markings. 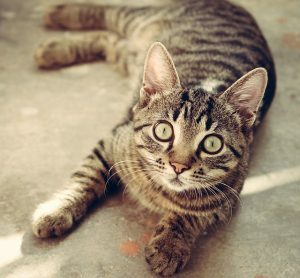 Urinating near window sills or patio doors could mean your cat has felt stressed by animals outside your home. If you ever see your cat backing up to a vertical surface, stepping in place with his tail quivering and spraying urine – that’s marking by spraying. The RX. Anti-anxiety medications can offer help many cats that are stressed or even territorial. Another solution is a product called Feliway which contain synthetic pheromones similar to what occurs naturally from your cat’s face and helps reduce anxiety. You may have noticed the way your cat rubs her face and chin on surfaces. By doing so, she releases a scent containing pheromones which has a calming effect. You can find Feliway in forms of sprays or plug-in diffuser. A, B, or C? In a multi-cat household, you may not know who the culprit is. If that’s your problem, you can either separate your cats or administer an approved fluorescin dye by mouth that stains your cat’s urine fluorescent green. PS You can learn a lot by simply observing your cat. If he jumps into the litter box enthusiastically, sniffs around to find the right spot, does his business and scampers happily out, your litter box has his stamp of approval. Approaching tentatively or leaving very quickly could mean he doesn’t give high marks to your provided facilities. Most cats will exhibit inappropriate elimination sometime in their lives. Give Town N Country a call and let us help you find the solution to a problem that’s more common than you may have realized. Introducing Visitors to Your Cat. It’s back to school time, and that means you can have more activity in your house. Scouting meetings, afterschool play dates, and tricker treaters mean you may welcome more individuals in and out of your front door. But how does your cat feel about that? For instance, did you know that cats consider eye contact an act of confrontation? It’s no wonder that many cats tend to disappear when new people come into their territory. All that looking and staring! What’s up with that? Ignore and don’t touch. The best advice to give anyone coming into your home is to totally ignore your cat. Even members of your family who are very familiar with your cat should never try to comfort him by petting or talking to him. Look the other way. Don’t make eye contact with the cat. When a new person comes in and doesn’t look directly at the cat, your cat begins to learn that newcomers might be okay – or at least not threatening. Reward her with a small treat left on the floor near her. She can investigate and take it at her leisure. Leaving so soon? Give your cat access to hiding places – a cat carrier or a favorite shelf or an open door to another room – for times he’s overwhelmed by people. Sit beside me. Sitting face to face makes your cat feel threatened, so choose a seat where you’ll be beside the cat. Sitting on the same level as the cat (for example, the floor or a lower seat) can invite a kitty to come closer. Can I have your attention? Friendly cats may approach visitors first and rub their bodies against their legs. For visitors who don’t care for that kind of attention, keep a few favorite toys close by to distract. Or if your visitor loves cats, this kind of cat-initiated affection is an invitation for that person to pet him. Spending extra time with your cat now can help him feel more comfortable whenever guests come calling. If you have any questions about your cat’s behavior or general health, give Town N Country a call. We love hearing from you. And we don’t consider eye contact a threat! All pets thrive on routine, and cats in particular can show signs of anxiety with any sort of change. You may notice their nervousness or fearfulness – as in a cat that retreats to his favorite hiding place. Some cats may even exhibit signs of aggression or even get sick. Absence makes the cat… You might assume your aloof cat doesn’t need you around all that much, but the truth is, she’s very accustomed to your regular coming and going. When your schedule changes, one solution is to establish short (10 minutes!) play time throughout the day. If you’re going to be away for extended periods, arrange for a friend to visit while you’re out. Bob the builder. You can’t avoid the loud noises associated with street repairs or maintenance on your own home, but you can provide a safe place for your cat. To help him focus on something different, leave a radio or television playing near your cat’s favorite space. White noise can distract from or disguise construction sounds. Consider placing a perch on the side of your home that’s furthest from the noisy project. Summer breeze. Thunder and lightning storms can raise anxiety for lots of people and pets. Again, white noise that’s created by a radio or television can help cover storm sound effects. Provide access to your cat’s favorite hiding place. If you’re home, choose this time to pull out favorite toys and play with your cat. Reward with treats so that he associates positive experiences with storms. If your cat’s very agitated during a storm, talk to us about medication that can help. The most wonderful time. When decorations go up, and guests come over, your cat may simply want to run and hide. Make sure she has access to his refuge. Vet visit. Cat carriers, car rides and needles – as nice as we are, your cat can find a lot of stressors in one simple visit. To help him cope, start early and introduce these experiences separately. Place the cat carrier within your cat’s access. His curiosity may lead him right into it, but resist the urge to shut the door right away. He may decide that the carrier’s a pleasant refuge – especially if you place a cat treat inside. On another day, shut the door and take your cat for a short ride. If every ride ends at the vet’s, your cat will simply associate the car with the vet, and your battle lines are drawn. Give treats for time spent in the car – and time spent at the vets. Try to schedule your pet’s appointment at a less busy time, as the sounds in a busy waiting room full of other pets and people can frighten your cat too. If you have an emergency situation, you don’t have the luxury of time. When you need to get your cat to us quickly, wrap him in a towel and place him in the cat carrier. When a little preparation helps your cat overcome common stresses, everyone feels the relief. What methods work best with your pet? Drop us an email, or comment on our Facebook page. We’d love to hear what works for your kitty and you! 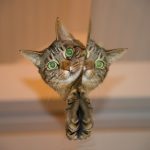 Is Your Cat Cute?! Enter Our Cute Cat Contest to Win! You send us your kitty’s picture below, and yes, you can be in it. We’ll post it on Facebook. We’ll let our Facebook fans vote on who they think is the cutest cat! The cat with the most ‘likes’ by September 30th at midnight wins! Pictures must be submitted by September 15th, but the earlier you enter, the more people will see YOUR cute cat so they can vote. Gift basket must be claimed at Town ‘N’ Country Animal Hospital by October 31, 2015. Boarding will include any two consecutive nights, with the understanding that drop off and pick up must take place during regular business hours. Stay may not end on Saturday night, as we are not open on Sunday. Free weekend must be redeemed by October 31, 2015. Transportation to/from the camp/condo is the responsibility of the owner. Employees and immediate family members of Town ‘N’ Country and Dash Web Consulting are not eligible.